In two trips to my son’s home in Pittsboro, he’s made sure we stopped at S & T’s while we were in town. It’s for good reason. 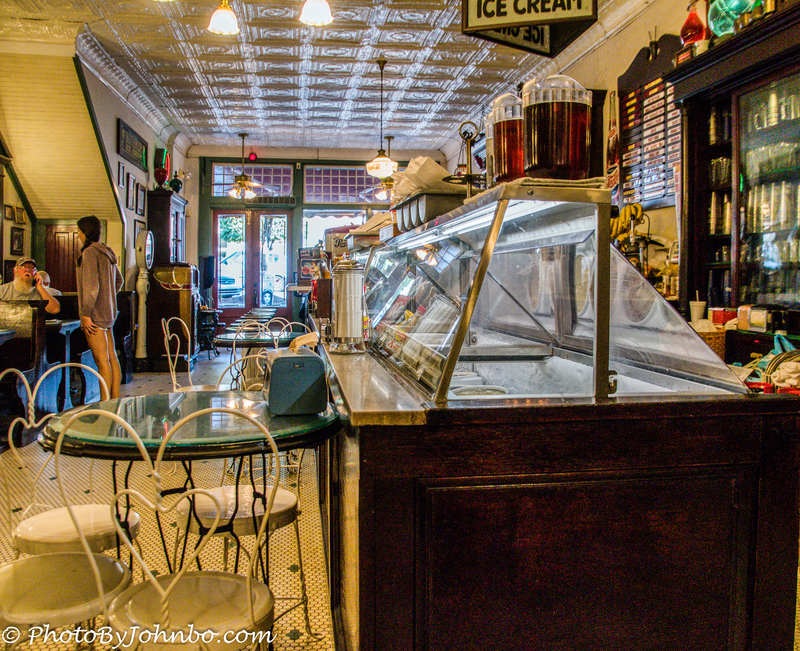 The restaurant is part ice cream parlor, part lunch counter and part historical museum. The goal, as envisioned by Gene Oldham who purchased the building in 1996, was to recreate a soda shoppe as it might have existed in the first half of the 20th century. I think he succeeded admirably. Everything from the tin ceiling tiles to the antique cabinetry is period accurate and the workmanship is beautiful. The owners credit Arthur Bouldin as the master woodworker who created booths, tables, and many of the other beautiful wood accessories. The long counter was crafted from three older counters. A seat at the counter is a pleasant place to grab a snack, a soda, or an ice cream treat. A simple sandwich and burger menu also features meal plates suitable for evening dining… but you better plan to eat on the early side as they close at 7:30 PM. The shoppe opened in October 1997 and after 21 years, it is still going strong. 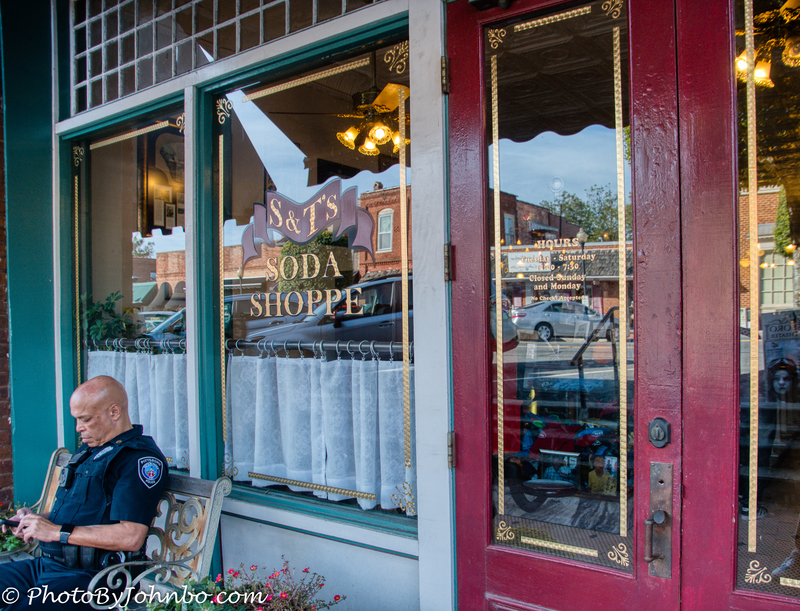 If you visit Pittsboro, be sure to avoid Sunday or Monday as the soda shoppe is closed. The beautiful casework in the restaurant was purchased from a drugstore in Mebane, North Carolina and carefully restored with the help of Keith Moore. 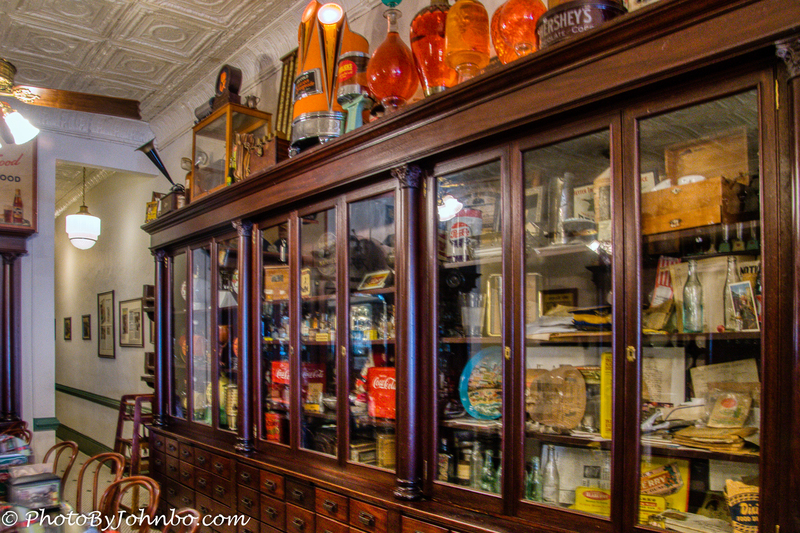 Inside the glass cabinets are dozens of examples of antique drug store equipment. One could spend hours just looking at the artifacts. Even the table accessories hearken back to an earlier and simpler time when kids would sit on the round counter stools and spin to their dizzying heart’s content. You can’t do much better on a hot summer day than to step inside, order a “Dr. Pilk’s Phizzie” or a Cherry Smash from the soda fountain and reminisce about life in simpler times. Most of the information from this post came from the S & T’s Soda Shoppe web pages. You can check out their menu, their history, and a photo gallery here. To get a better view of the images and to scroll through the gallery, in most browsers, you can click on one of the thumbnails below. Good research! The family who owns S&T are so nice. The definition of Southern hospitality! They have a neat history on their web page! 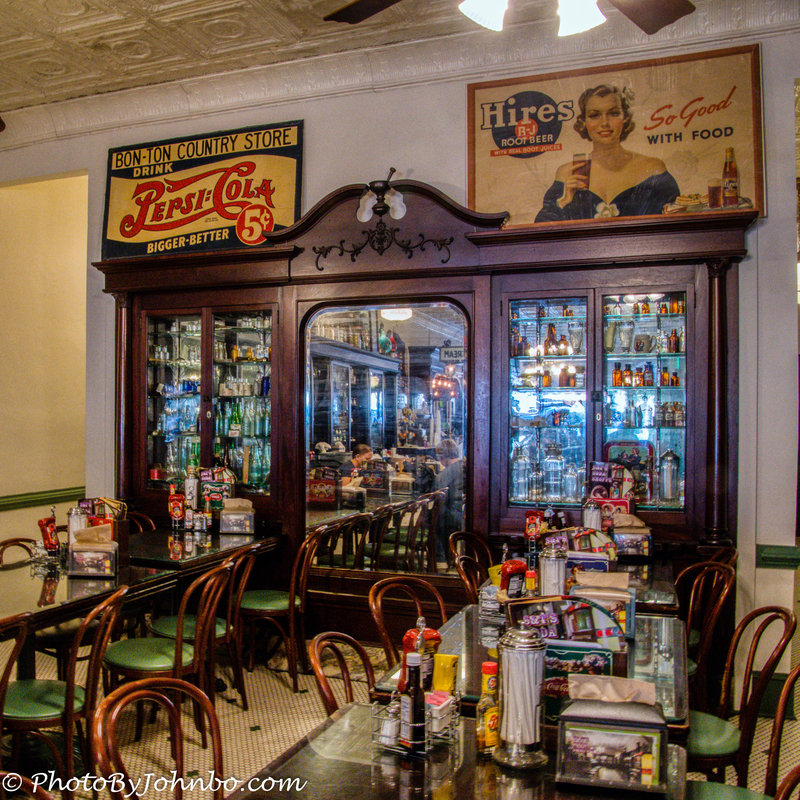 Thank you John for the wonderful photos and kind words about the Soda Shoppe! Our Family really appreciates this very much! We surely enjoyed our visits there and look forward to coming back next time we are in Pittsboro!